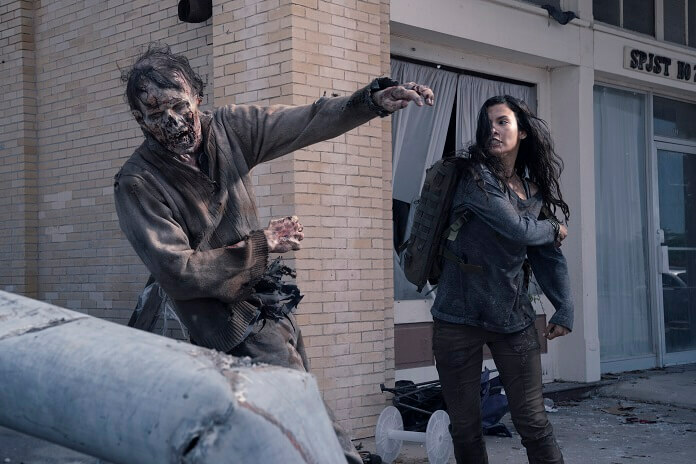 Fear the Walking Dead Season 4 Episode 13 Recap: "Blackjack"
AMC’s Fear the Walking Dead season four episode 12 concentrated on moving Morgan (Lennie James), June (Jenna Elfman), and Al’s stories forward while also providing more details on Morgan’s new traveling companions. The episode ended with June and Al (Maggie Grace) reunited with Morgan’s group while not far away the mysterious stranger turned Quinn, an adversary turned potential friend, into a walker. Season four episode 13 begins with June, Al, and Morgan trying to find Quinn. 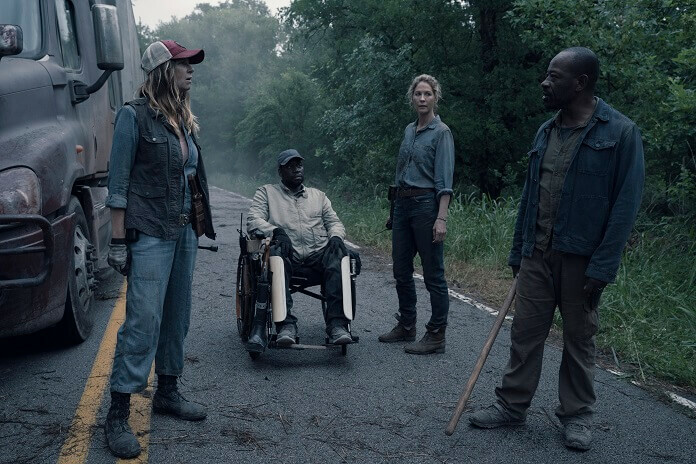 He’s not at mile marker 21 and they decide to continue looking, making Sarah (Mo Collins), Wendell (Daryl Mitchell), and Jim (Aaron Stanford) wait back at the truck. As they wait, a walker arrives to keep them busy. Jim’s never taken one out before and doesn’t get to this time because Sarah steps in and handles it, stripping him of his opportunity to make his first kill. It turns out the walker’s the one the mysterious woman was keeping as a pet, and it has “take what you need…” written on its face. Sarah radios Morgan that he needs to return to the truck ASAP. June keeps trying to reach Quinn and finally the mysterious woman puts him on the walkie talkie. He’s a walker now and can only growl, and the woman tells June that Quinn is now what he was meant to be. Morgan recognizes the voice, takes over the walkie, and when the woman calls him by name it freaks out the group. She explains they shouldn’t be leaving boxes by the road because they make people weak. She assures Morgan if they stop with the boxes, she won’t have to make him strong again – meaning she won’t make him into a walker. She also hints she knows what Morgan’s capable of. Finally, it’s time to reconnect with Victor Strand (Colman Domingo) and John Dorie (Garret Dillahunt). Victor rummages through supplies at a ranger station and then uses binoculars to check out the nearby forest and river. John’s busy cutting up branches which he ties together to make a raft. He’s interrupted by a walker who emerges from the water which, it turns out, is actually a flooded road. John thinks it will be weeks before the water drains since the levy broke, but Victor’s unwilling to get on the raft and escape. He’d rather stay in the ranger station where at least it’s dry. John’s sure Victor will run out of food before the flooding subsides, but Victor really doesn’t care. John won’t be dissuaded and is ready to embark on this mission solo. He’s determined to find June and the rest of their crew. Next, we get to catch up with another character who’s been missing from the action, Luciana (Danay Garcia). She’s made it to the Nolan County Library where she believes she might find Charlie. No one answers when she calls out inside the library, and when she heads back outside she finds an injured man trapped in a car. He was hurt during the storm and Luciana tries to help. He introduces himself as Clayton as Luciana gets to work trying to free his legs. John gives Victor one last chance to accompany him on his rafting adventure. Victor turns John down but takes pleasure in having a seat and watching him struggle to keep his raft afloat. It’s hopeless and the raft won’t carry his weight, falling apart just a foot from the shore. Victor’s the first to notice a massive alligator heading John’s way, and John’s able to shoot at it before it attacks. Alligators, wet walkers, and a raft that doesn’t float combine to keep John from setting off to find the others. He realizes he’s stuck with Victor until the water recedes. Morgan, Al, and June make it back to the truck and after a brief discussion/argument, they decide they need to continue to try and track down their friends. Meanwhile, Luciana continues to try and free Clayton from the car. He tells her it’s no use; the car’s what’s holding his body together at this point. Luciana asks if there’s anyone she can find for him, and there isn’t. Instead, he just wants one last beer. She promises she’ll find one. John finds a truck with a camper shell and figures out they can use the camper shell to make it across the river. John can’t climb the small hill, take out the walker inside, and get the truck because he’s still not fully recovered from being shot. He tries to make Strand feel guilty since he was with Alicia when she shot him, but Strand’s not having it. However, he does reluctantly agree to try to get the camper shell. Morgan assures June they’ll find John and all the others. Victor makes it up the hill to the truck and instead of loosening the camper shell, he gets distracted by a bottle of Scotch Whisky on the floorboard. He struggles to reach it and is pulled into the truck by the walker in the driver’s seat. Their fight causes the truck to tumble down the hill, landing right-side up at the edge of the river. The walker’s been impaled in the process and Victor makes it out of the tumble just fine – and so does the bottle. John’s angry at Victor for almost killing himself, but Victor seriously doesn’t care. He wishes John luck with his second raft. Luciana continues to search for beer. John sets to work making the camper shell into raft. Victor relaxes with his bottle and John, taking a break from his raft building, wonders if he’s always been a drinker. Victor admits he drinks more now because he’s drinking to forget he doesn’t have anyone to drink with anymore. He believes he only has his memories and nothing to look forward to. John shows Victor the car horn he’s rigged up as a noisemaker to distract the gator. Victor’s not sure it’ll work but admits he didn’t think John would survive a gunshot either. John tells him he has to believe in something and needs to keep on fighting. Victor finally agrees to join John on the raft. Luciana discovers a bottle of root beer, which has her fooled for a minute, but otherwise her search for beer has been a failure. Clayton thanks her over the walkie for doing what not many strangers would have done. He then tells her a story about his former life and how he ran away from those who cared about him. When the zombie apocalypse hit, he realized his mistake. He then dedicated himself to helping others. John sets off the horn and they wait by the raft to make sure the noise is bringing walkers to the water to distract the alligator. They then start paddling across the river. They watch the alligator make a lunch out of walkers as they slowly paddle across the river. Unfortunately, the noise stops when they’re not even halfway across. The walkers about to enter the river stop and turn around, which means the alligator is no longer distracted. It comes for the raft, knocking a hole in the bottom. John shoots at it but either misses completely or just wings it. As the boat takes on water, John and Victor argue over the next course of action. John thinks they can make it to the other shore by swimming, but Victor knows John isn’t even strong enough to row the raft. Victor demands John fire his gun which will draw the walkers back into the water. While the gator munches on zombie meat, they’ll swim back to the closer shore. John reluctantly agrees. They dessert the raft and return to shore. Luciana comes upon the box with Morgan’s note to use channel 4. Inside the box is a bottle of beer, and Luciana smiles. She returns to Clayton, mission accomplished. He can’t believe she didn’t give up and Luciana explains she couldn’t help a friend during his last moments, and she wasn’t going to let that happen again. Clayton takes a sip and looks content as he thanks Luciana. Clayton asks if he can give her a couple of notebooks he used to record where he left supplies. Tears streaming down her face, she nods her head yes and then asks about the job that took him away from his family. He reveals he was a truck driver. John and Victor are back on dry land and John’s obviously upset he failed to embark on his search for June. Luciana’s reunited with Morgan and the gang, and she has the notebooks. She explains Clayton said what he recorded could help people, and Morgan wonders if he knew where she found the beer. Luciana confesses she didn’t get a chance to tell him. As Morgan, Al, June, and Luciana are catching up in the back of the truck, they hear another unexpected voice. Charlie and Alicia (Alycia Debnam-Carey) have made it to one of the boxes and before Alicia can stop her, Charlie uses the walkie. Morgan replies and Alicia immediately recognizes his voice. Alicia tells him they’re at mile marker 84 at a box. Morgan says they’ll come back, and just then the mysterious woman chimes in. “I gave you the chance to be strong,” she warns. Morgan tells the stranger she’s wrong and that helping people doesn’t make anyone weak. He confesses he’s been where she is and she’s not doing the right thing, even though she thinks she is. He confirms they’re going to keep finding the people they’re looking for and helping them, and then they’ll help her. Sarah’s been driving the truck during this reunion, and she uses the radio to tell the group in back of her truck that Al’s van is on their tail. Al wants Sarah to try and outrun it, but the van keeps gaining on them. The mystery woman’s in the van and she pulls even with the truck. She opens fire using Al’s guns. Alicia and Charlie can only listen over the walkie to the roar of gunfire.